Saryuja Skull Dread is the second-most hyped card out of the newest set, and not second by much. 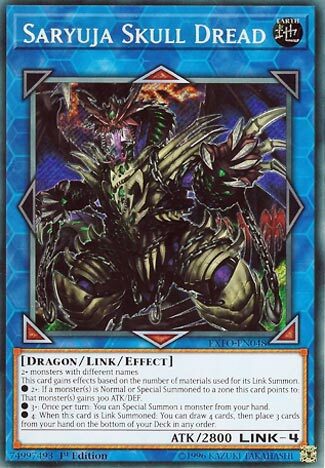 A much more versatile card, Skull Dread takes at least 2 monsters to Link Summon, usually four if you aren’t using other Link Monsters, and they have to have different names. Simple enough to summon for a big monster. The more monsters used for the summon, the better effects you get. Small ATK/DEF boost to a monster in a zone Skull Dread points to, if you use two monsters for Link Summon of this card. Three monsters for the Link Summon gets you a Special Summon from the hand once per turn. This effect gives you more options to Link Summon more in the turn, gain advantage on the field, get advantage from your monster(s) effects, and you don’t need a zone Skull Dread points to for this Special Summon. The draw effect is what made this card so popular though. Use four monster for the Link Summon, and you get the previous two effects, and you get to draw four, then put three from your hand back into your deck, at the bottom in any order. This card can turn the duel on this effect. Crap hand? Skull Dread can fix that. The only time this effect isn’t useful is when you have no cards in the hand, only netting you a +1, though that is still a win with no hand. This card points to all the bottom zones and up to your opponent, giving you options like no other Link Monster has given you. Three slots open to drop Extra Deck monsters in helps almost any deck to spam the board no matter what deck you run. With Firewall going to 1, if you didn’t have enough space for Skull Dread, you do now. If you planned running one, you can run two now. It is a great card that any deck that can Link Summon can use and can vastly change the game depending on how much you invest. Big Dragons are cool and Saryuja Skull Dread is a big Dragon. It is a Link-4 Earth Dragon-type Link Monster with 2800 Atk and all three bottom arrows and the top middle arrow. Those are great arrows and a really good Atk with one “bad” arrow. Then it gains effects based on the number of monsters used to Link Summon. You can use any monster combination so long as they have different names. 2 or more monsters gives a 300 Atk and Def boost to anything summoned to a zone it points to. 3 or more lets you Special Summon a monster from your hand once per turn. Finally 4 or more lets you draw 4 cards and return any 3 cards from your hand to the bottom of your deck, but only the turn Saryuja is Link Summoned. The combos are nearly endless. Any deck that uses monsters can Link Summon this guy to full effect. Obviously, you would want to use the effects in reverse order, first reset your hand, then Special Summon, then enjoy the boost if you decide to put the monster on a zone Saryuja points to. Versatility, strength, and a combo extender, this card should be run in multiple. Good luck budgeting your money. Yay, we get to review my favorite Link Monster, and a card that has two one card combos to summon, Saryuja Skull Dread. Skull Dread is an Earth Dragon Link-4 with 2800 ATK and arrows pointing Up, Bottom Left, Bottom, and Bottom Right. ATK is good, type is one of the best in the game, Earth is fine, arrows are great even though my greedy self would of loved a Left or Right arrow instead of Up. The summoning requirements are 2+ monsters with different names. Very generic, but you cannot just use Scapegoat then use all the tokens to summon it. I’ll give you one of the two card combos now, the other one I did in my Grinder Golem article. Well, this one is a two card combo, but the second card just has to be any monster. Summon Orphys Scorpio, ditch to summon Darlingtonia Cobra then use Cobra to search Brilliant Fusion, use Brilliant Fusion ditching your Gem-Knight and either Trick Clown or ditch Damage Juggler and banish it to get Hat Tricker, summon Serapininte, summon the Trick Clown or Hat Tricker you searched with Damage Juggler, use your extra Normal Summon with Seraphinite, finally use the Scorpio, Cobra, Seraphinite, and Hat Tricker/Trick Clown to summon this guy. And what do you get? All four of these effects, cause they are all based on how many monsters you use to summon this guy. 2+: Monsters summoned to a zone this card points to gains 300 ATK and DEF. 3+: Once per turn, you can Special Summon a monster from the hand. 4+: When it is Link Summoned, you can draw 4 cards and put 3 back at the bottom of the deck. Well the first effect is neat for boosting monsters. The second effect is outstanding for extending combos, and I love extending some combos. The third effect is the best one, being able to get rid of bricks to draw into cards that extend combos as well as his second effect is lovely. I love this card, I imagine it will be a Link-4 staple along with Borreload Dragon and sometimes Firewall Dragon. Saryuja Skull Dread is a monster I’m surprised didn’t arrive sooner. This huge guy is a play extender for days, and could very well be a staple when links reach their apex. First to catch the eye is his amazing summoning requirements. Any combo of different monsters, including tokens, for 2800 ATK is incredible. Then, comes his alluring arrows. With no left or right arrows, it’s like he demands that he be on the field. And that’s no problem for the modern player, is it? Not when he can potentially special a monster from the hand for free and reload your hand. However, I would like to note that Skull Dread is most likely not going to be used a majority of the time for the 3+ and 4 material effects. I’d be surprised if players use his 4 material effect very often. Because he’s so easy to summon using one or two previously summoned link monsters and he gives players three arrows to work with, I’d have to predict that over the course of time, Skull Dread is going to have the most value just by being an easy two-material beast that extends plays. Scapegoat makes this guy by itself in various ways. In fact, I’ve often predicted in the last year that eventually we’re going to see effect monsters that count for 2+ links in a link summon, even though they’re not link monsters themselves, and that’s when Saryuja might just become broken. Not because of his best effects, but because he’s just a big easy mountain. Now don’t get me wrong. Of course he will be mighty in all types of decks that can easily go into four-monster plays. My prediction is solely about his use over the course of the meta and its changes until he becomes outdated, whenever that is. Might be a while, because of how generic he is. He definitely has a sizable future to look forward to.